How have I not seen this before? If this is digital fakery, it is first rate, to appear to be at a live car show. The video is from AutoBild, and in a foreign language, and mostly talks about the original Montreal. 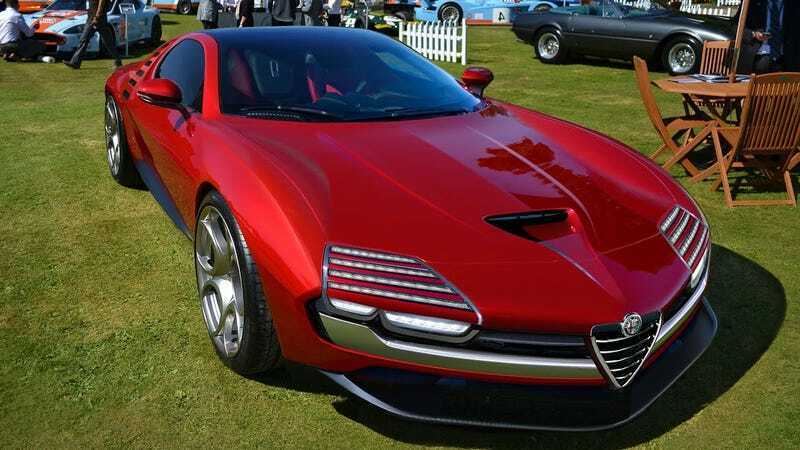 I know Alfa has done many different retro concepts, from Duettotanta, to TZ2, 6C, Diva, and the Disco Volante. I had not seen this Montreal remake... and it is fantastic. I’d almost second-mortage my house to have a car that gorgeous in the garage, like keeping a mechanical mistress. It would probably end as badly as the metaphor suggests. Imagine a car like that, with performance-oriented PHEV hybrid drive, like BMW i8, but with the engine/regen in the front, and a tesla-style electric drive rear axle, and 20KWh or so worth of battery capacity for a bit of full-speed electric-only range, cruise charging on the highway, or combined-output performance mode. Why can’t gorgeous be attainable and enjoyable?